It’s amazing the changes that can happen in a decade. At the start of the noughties, minidiscs were the way forward for music, only to end up replaced by the iPod. The internet has helped fuel the rise of mp3, but most people who tried to use it at the turn of the century will be familiar with this sound. DVDs for VHS; Muslim extremists for Irishmen as the stereotypical terrorist and bogeymen-in-chief; a Yugoslavian national team, albeit a pale imitation. All changes over the noughties. While La Liga was being compared to the Scottish Premier League thanks to the dominance of Real Madrid and Barcelona at the end of the decade, it was a much more open competition at the start. Deportivo La Coruna, who would be end up being relegated in 2011, won the first La Liga title of the decade, with Real Zaragoza finishing above Real Madrid in fourth. Mallorca would finish third the following year, and Valencia would win the league under Hector Cuper the next season, repeating the feat two years later under Rafael Benitez. Among these great sides were the Real Sociedad class of 2002-03. Having finished 13th the year before under the brief stewardship of Roberto Olabe, the Basque club turned to Frenchman Raynald Denoueix to lift them. Denoueix had only ever managed Nantes before, spending 15 years involved in their youth academy, before taking over the senior squad in 1997. He led them to the French Division 1 title in 2001, only to be sacked by the end of the year for poor results the following season. Nevertheless, Sociedad focussed on the good, and made the wise choice of hiring him. That season, they took La Liga by storm, employing a fearless attacking game that almost won them the league. The defence was unspectacular but decent nonetheless, consisting of Agustin Aranzabal on the left, Aitor Lopez Rekarte down the right and Igor Jauregi and Gabriel Schurrer in the middle. What did set it apart was the presence of Sander Westerveld behind it, back to the form that saw Liverpool win a treble in 2001, rather than the form that saw him replaced by Jerzy Dudek and Chris Kirkland the following season. In total they conceded 45 goals that season, which, although unimpressive in England, was pretty much the standard for top teams in La Liga, and still is outside of the big two. Although individually they weren’t anything special defensively, they were good collectively, also helped by the shape they used. It was a 4-4-2, with Xabi Alonso and Mikel Aranburu sitting in front of the back four, giving them greater protection, and Javier De Pedro and Valery Karpin high and wide to join Darko Kovacevic and Nihat Kahveci in attack. The team seemed to have developed an understanding, which allowed them to press without leaving any gaps – simple stuff, but difficult to implement and extremely useful when pulled off. They played in perpetual motion: one played would press then the rest of the team would adjust. If Alonso stepped out, Karpin would drop deeper and narrower or, if free, Lopez Rekarte would step up and infield, while Aranburu would shuffle a little bit across. 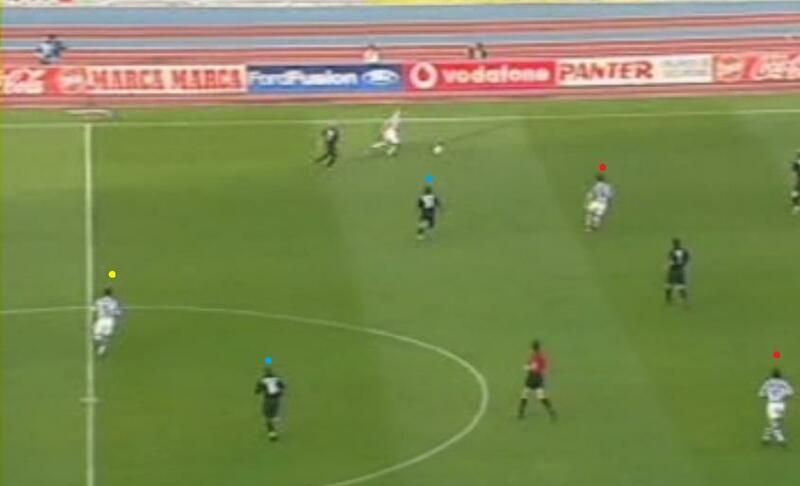 They managed to compress space, limit passing options and give their opponents little time on the ball. Once the ball was won, the players all complimented each other brilliantly. Either of the little and large combination of Nihat and Kovacevic could lead the line or drop deeper to link play, while Karpin would move into this central space too, free to roam as he liked – this space extended by the deeper positioning of Alonso and Aranburu forcing the opposition midfield higher up the pitch to combat them, although Aranburu would occassionally venture forward if needed. Sociedad’s deep midfield (red) force Real Madrid’s midfield (blue) higher to combat them, giving the attack (yellow) more space to drop into. If the opposition failed to close the pivot down, Alonso was given more time to pick out players with his pinpoint passes. The main recipient of these was Javier De Pedro – the classic wide man, hugging the touchline, running at players and hitting in crosses with his beast of a left foot, although also very capable of exchanging passes in midfield and linking very well with Aranzabal. De Pedro’s positioning was key to Sociedad’s success as the width he provided allowed everyone else to move as they liked, although full-backs Aranzabal and Lopez Rekarte ventured forward to some success too, and also acted an easy outlet for counter-attacks. The system worked brilliantly and Sociedad would have done the unthinkable by winning the league were it not for the last great Galactico side. Having gone unbeaten at home all season, Sociedad went through most of the year topping the table, only to lose 3-2 at Celta Vigo in the penultimate game. Real Madrid, who had been beaten 4-2 at Anoeta, won 4-0 against Atletico Madrid to put them two points ahead. Sociedad beat them too in their last game, but Madrid beat Athletic Bilbao to seal their title. Just as Roy Makaay and Diego Tristan had done for Deportivo, Nihat and Kovacevic battled it out for the Pichichi trophy, managing 23 and 20 goals respectively, although they ended up empty-handed again when Makaay ended up winning it anyway. They qualified for the 2003-04 Champions League, finishing behind Juventus in a group also containing Galatasaray and Olympiacos, only to be beaten by Lyon in the next round, but all was not well at home. As had happened under Denoueix at Nantes, Sociedad collapsed after their success, finishing in 15th. Denoueix left after that season and hasn’t managed a team since, while Sociedad continued their low finishes until they were relegated in 2007, most of the 03 side having moved on by then. I remember that season, I remember watching pretty much every game with my dad, a life-long Real Sociedad supporter. He would keep telling me how that team was better than the R. Sociedad teams that won the league back in the 80s. I also remember how, when the final game against Atletico Madrid ended, pretty much everyone who was in the stadium jumped on the pitch and began cheering the players up, carrying them on their shoulders as if they were heroes, perhaps realising that coming second was a pretty awesome achievement for a team that was expected to get relegated. And sadly, we did get relegated not long after that. Hector Cuper never won a La Liga title… Benitez won both of them for Valencia. Cuper went to Inter before Valencia won the league. @tungdo310 Cheers. Glad it's of some use to someone.